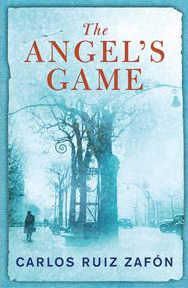 The Angel’s Game(El Juego del Angel) is Carlos Ruiz Zafons second book to be translated after Shadow of the Wind(La Sombra del Viento). In a way The Angels Game is a prequel to Shadows of the wind, but the stories are not linked, only some characters, The Cemetery of Forgotten Books and Sempere bookshop. I read Shadows of the Wind four years ago so it was only at the end that I realized the actual connection. “The Angels Game” is a well written story, it’s a mystery and love story. It’s the same structure as “Shadow of the Wind “only more darker and evil. But it reads well and the story fascinates enough to read it in one read. I read it in three day, could be faster if I didn’t have to work. While The Angel’s Game is good I think Shadows of the Wind is better. When I was in Barcelona a few months after reading “Shadow of the Wind” I bought the original Spanish version. Just a paperback but I’m always pro to reading a book in it’s original language if possible. I think I’ll be searching for the Spanish first edition of both books. I’m never one to specifically want first edition, except for the Harry Potter series, which by the way I need first edition copies of book 1 till 3. If you have never read Carlos Ruiz Zafon you should now, and even though “The Angels Game’s” time line is before “Shadow of the Wind” you should read “Shadow of the Wind” first. Spoilers ahead stop reading if you haven’t read the book yet! I noticed a few “huge” gaps in the story that bothered me a bit or maybe I just missed something. ‘That brooch with the angel’, he said, touching his lapel. “Yes?” “I’ve seen you wearing it on your lapel ever since I met you’, he said. Grandes is referring to the same brooch that the mysterious publisher Andreas Corelli wears all the time. I still don’t get the meaning…because Martin even commented to Corelli about the brooch Corelli always wear. So what does it means that Grandes notices that Martin wears that brooch all the time? Second thing I didn’t get. At the end Martin gets that Salvador is in fact Diego Marlasca. But how could Martin fall for it? Diego Marlasca we later find out doesn’t age anymore since he closed a deal with Andreas Corelli. Then we learn that Diego murdered Salvador and took his identity to fool Martin. But wouldn’t the real Salvador be an old man when Martin meets him years after the the supposed suicide of Diego Marlasca? I know that Andreas Corelli probably is the devil Lucifer. Although this isn’t said anywhere. But it’s obvious evil is at play. But even so Marlasca was just a writer who closed a pact with the devil so except to not age anymore he couldn’t change appearance or anything. These two points bothers me a bit as it feels more like a badly done loose end on the part of Zafon rather then part of the mystery. But again maybe it’s just me and I missed something. You can find me on Twitter. Mail me at darice [at] darice.org. Look at pretty pictures on Instagram and Flickr. I'm available for accessibility related opportunities.